A set of 15 samples of different materials used to challenge students to identify materials based on measurement of their density. For some specimens this will be straightforward. In other cases, it will lead to a discussion of uncertainty in measurements and data, and to an awareness that different materials may have nearly the same density. 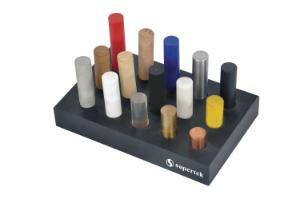 Included in the set is a wooden base where you can display the 15 material samples easily and quickly. Also included are instructions and experiments for you to conduct.